The Operations Division is perhaps the most visible component of the Sheriff’s Office as it encompasses the Sections of the organization with which the public is most likely to have contact: Patrol and Detectives. However, reflecting the diversity of the Sheriff’s statutory obligations, the Division performs a number of other functions including coordinating emergency search and rescue events, serving civil process and conducting evictions, coordinating the response to wild land forest fires, providing Animal Control services, and providing assistance to the community through the Victim Assistance Program and Restorative Justice and Community Assistance Mediation Program (C.A.M.P.) programs. Additionally, the Sheriff’s Office provides law enforcement services by contract to the Towns of Superior and Lyons, acting, in effect, as their municipal police department. Sheriff’s deputies have law enforcement authority throughout Boulder County, an area encompassing nearly 740 square miles of some of the most diverse topography, industry, and demographics found anywhere. From the High Plains to the Continental Divide; from rolling wheat fields to snowcapped peaks towering over 14,000 feet; from ghost towns to bustling urban communities; from hard rock mining to high-tech research and development, Boulder County has it all. With a population of nearly 300,000 people, the Sheriff’s Office has primary law enforcement authority for the County’s unincorporated area (i.e. outside municipal city limits) and the Towns of Superior and Lyons. The Sheriff’s Office “direct service population” is about 58,000 permanent residents, plus the thousands of people who transit Boulder County for business and pleasure every day. The Operations Division employs 135.75 full-time employees (FTE’s) of whom 102 are sworn, certified deputies. Additionally, nearly 100 Volunteer Programs assist in accomplishing the Division’s mission. The Patrol Section is responsible for providing law enforcement services to the unincorporated areas of Boulder County and the towns of Superior and Lyons on a 24 hour a day, seven day a week basis. Deputies provide coverage to the roughly 650 square miles of unincorporated (the areas outside of incorporated cities) area within the 741 square miles of the county. The county is divided into seven patrol districts, with teams of deputies are assigned to each district. 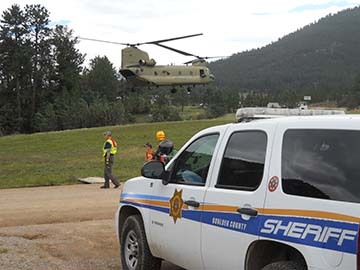 Given the amount of terrain they have to cover, deputies are trained to handle most events on their own and are expected to function independently. They are given additional training in the processing and preservation of crime scenes, though in some circumstances a detective may be called to respond to provide additional expertise. Additionally, most misdemeanor crimes are assigned to patrol deputies for follow-up, therefore freeing detectives to work on felony case investigations. While deputies have law enforcement authority within the municipalities, their efforts are generally directed to the unincorporated areas, with the exception of the towns of Lyons and Superior, which contract with the Sheriff for public safety services. The Patrol Section staffing is adjusted for peak call loads and special assignments (eg. DUI and traffic enforcement) and events (eg. holiday weekends), with traditionally busier times of the day having additional deputies scheduled on duty. In general, however, there are at least seven patrol deputies and a supervisor on duty at any given time. Additionally, three deputies serve as School Resource Officers and work specifically in area high schools, while four deputies and a sergeant are detailed to patrol County Parks and Open Space properties. In 2009, patrol deputies were dispatched to or self-initiated 61,711 events/calls for service (as recorded by our Computer Aided Dispatch system), as compared to 62,640 events in 2008. They documented the investigation of 6,940 crime and incident reports, not counting traffic citations, alarm warnings, and miscellaneous other forms of documentation. They made 2,850 arrests. Additionally, responding to residents’ frequent complaints about traffic violations, deputies cited 8,399 violators in 2009. 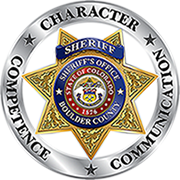 The Property and Evidence section handles all property that is booked at the Boulder County Sheriff’s Office. This section is responsible for maintaining the integrity of the evidence and works closely with deputies, the municipal prosecutor, the district attorney’s office, and municipal, county and district courts. To reclaim property from the Property and Evidence section, you must call 303-441-3629, Monday – Friday 7:30AM – 4:30 PM, to make an appointment. All property is released by appointment only. The Detective Section is charged with investigating felony crimes, domestic violence incidents, unattended deaths, and other matters that require substantial time and resources to resolve. Narcotics and drug trafficking cases are investigated by the County’s multi-agency Boulder County Drug Task Force (BCDTF). Sheriff’s investigators handle approximately 1200 cases each year and maintains a clearance rate of 60%+. The Detective Section is staffed by three supervisors, 10 detectives, a Crime Analyst, a Forensic Computer Analyst, and two Property and Evidence Technicians. Colorado state law requires that the Sheriff of each county serve the civil process of the Courts within their jurisdiction. They are also required to accept and serve civil process from all other Colorado counties, each of the states of the union, and the federal government. Civil process includes all types of papers resulting from civil litigation, including summons and complaints, subpoenas, court orders, writs of execution, writs of garnishment, and Evictions and Writs of Restitution (commonly known as eviction orders). The Sheriff’s Office’ Civil Section is staffed by three full time deputies, an hourly deputy, a paralegal, and two law enforcement technicians (L.E.T.’s), acting under the supervision of a commander. The uniformed deputies of the Patrol Section periodically supplement the efforts of the deputies assigned to the Civil Section, particularly for after hour and emergency events (eg. the service of domestic protection orders). Of the 4,521 papers received in 2009, deputies successfully served 3,358 (74.3%) of them. The Emergency Services Section functions to meet the statutory responsibilities of the Sheriff in conducting search and rescue efforts, coordinating wildland fire suppression and mitigation efforts, and investigating hazardous materials incidents and structure fires. Additionally, the members of the Section act as a liaison to the other emergency service providers in Boulder County. The group is comprised of an emergency services supervisor, two emergency services coordinators, a fire management officer, and ten hourly fire mitigation team members.